Choose My Account → Account Settings and log into the system if necessary. 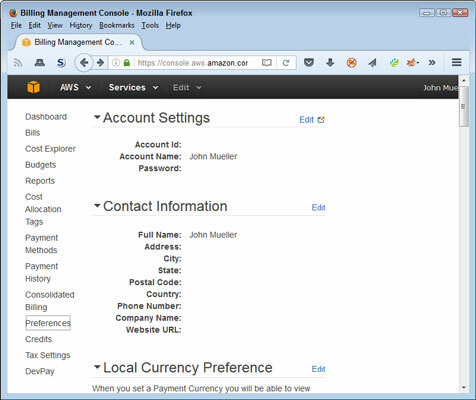 You see the Billing Management Console shown (you’ll see your personal information). Click Preferences on the left side of the browser window. You see a list of billing information preferences. 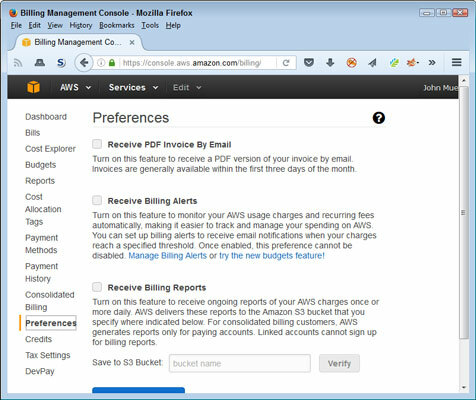 Select Receive Billing Alerts and then click Save Preferences. 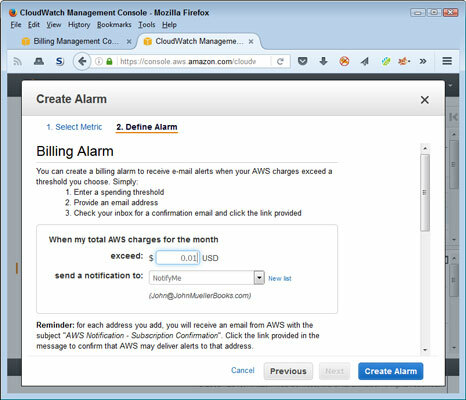 Click Manage Billing Alerts to create an alarm to tell you about any charges. Halfway down the page, you see the Alarm Summary section. Choose Metrics\Billing on the left side of the display. You see the metrics shown. Notice that you can choose various metrics to monitor. 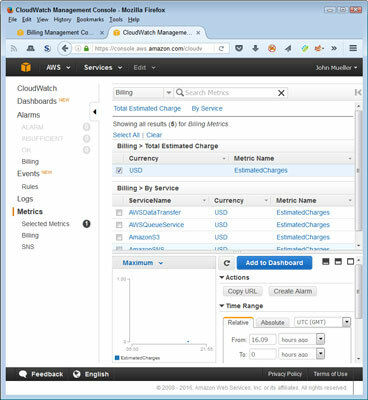 For example, you could choose to monitor the charges with specific services instead of all the charges. This example assumes that you want to monitor all the charges. Select USD under Billing → Total Estimated Charge. You see the Create Alarm dialog box. Use the fields in this dialog box to determine the level at which you get informed about charges and the email address used to inform you. (Optional) Type an email address or select a group in the Send a Notification To field. Using the default NotifyMe option sends the notification to the person who owns the account. 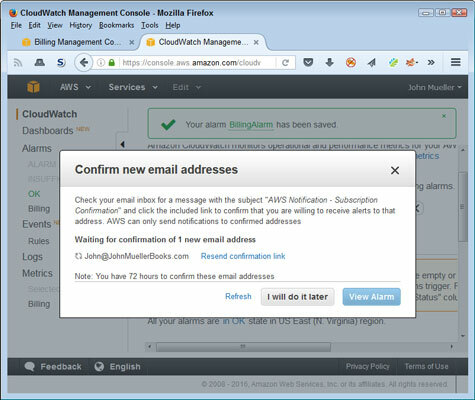 In most cases, you see the Confirm New Email Address dialog box shown. The alarm isn’t active until you confirm the email address, but you don’t have to do so immediately. If you don’t confirm the email address in 72 hours, Amazon cancels the alarm. During the testing phase for this book, the notification didn’t appear immediately, so you need to be patient. Confirm the email. Amazon begins notifying you whenever it charges your credit card for any amount exceeding the threshold you set. To verify that the alarm is set, choose Alarms\OK. You should see the alarm with a blank Config Status field (showing that you confirmed the alarm). You must explicitly close your account when you finish using it. To close your account, choose My Account →Account Settings. Log in to the system, if necessary. At the bottom of the first page you see is a Close Account section. 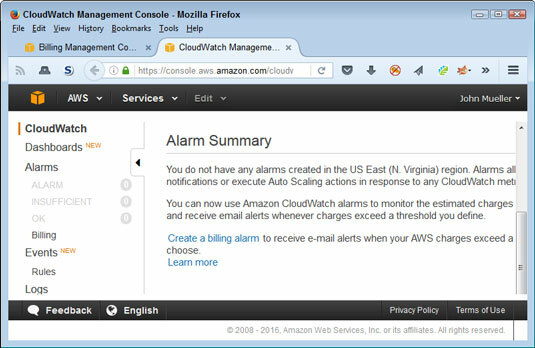 Click Close Account if you’re certain that you’re done using AWS. The same page has a Cancel Services section, in which you can cancel services you no longer need. This is a good option to use if you come to the end of the 12-month free usage period and decide you want to continue working with services that don’t have an expiration date.